Wines Elementary fourth-grader Ben Rinvelt celebrated his 10th birthday in a special way this year: He asked friends and family to donate to Habitat for Humanity of Huron Valley instead of giving him birthday gifts. Wines fourth-grader Ben Rinvelt with the T-shirt and book given to him as a "thank you" from Habitat for Humanity of Huron Valley. The youngster collected donations for the chapter in lieu of birthday gifts this year. He raised about $100, which he and his dad, Jeff Rinvelt, dropped off during a surprise visit to the Habitat ReStore on a recent snowy Saturday. Megan Rodgers, a development associate with Habitat for Humanity of Huron Valley, said the staff was pleased with Ben’s initiative and that he chose their nonprofit. They contacted the AAPSNews to share Ben’s story. 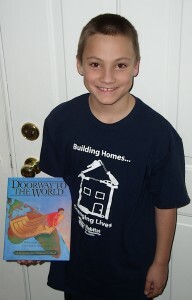 The staff sent along a thank-you note to Ben with lots of kudos for his selfless effort, as well as a Habitat T-shirt and a book called “Doorway to the World” which, coincidentally, features a boy named Ben. In the story, Ben leaves his home and friends and moves to another country, where he realizes the importance of the work he and his parents do for Habitat for Humanity. Rodgers said that Habitat is involved with several youth programs in area schools, but that this is the first time she can recall an individual student doing this sort of fundraising and donation. 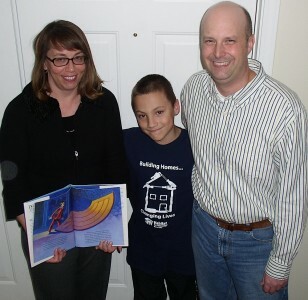 Ben turned 10 in January and said he felt Habitat was an organization worthy of his efforts. Last year for his birthday, he asked for donations for the Humane Society of Huron Valley, which serves Washtenaw County. Most of those donations were for shelter supplies and needs, unlike this year’s effort for cash donations. Ben explained that his weekly allowance is put into a bank that has three parts: spend, college fund and “Make the World a Better Place.” He said the “spend” part usually goes into the college fund or into the third category of giving. Ben Rinvelt with his mom, Pat, and dad, Jeff, at their Ann Arbor home. Jeff Rinvelt said he is especially proud that Ben is thinking of others. Ben has a younger sister, Anna, whom he has inspired to consider what she might do on her birthday in June, the family said. Ben is already thinking about next year, when he is considering giving to the Strong Kids Campaign at the Ann Arbor YMCA, which helps fund weeklong trips for kids to summer camp among other programs that promote positive behaviors. Established in 1989, Habitat for Humanity of Huron Valley has built or renovated more than 85 homes in Washtenaw County. Habitat homeowners qualify for an interest-free mortgage from Habitat, make a modest down payment and each adult puts in at least 300 hours of “sweat equity” building their home. Habitat also has the 15,000-square-foot ReStore that sells donated building materials with proceeds going back into the program. Editor’s note: Although the AAPSNews does not typically print the full names of elementary school students, this story was written with the permission of the student’s parents.